First as a note, while I support minimal user fees for public transit, I don’t have much patience for those who complain about any fare increase. The costs of running Metrorail — especially employee health insurance and electricity — have increased exponentially in recent years. However, funding from the area jurisdictions has not kept up. The agency was left with little choice than to raise fares to make up the difference. While the best solution might be a stable dedicated funding source, forcing austerity by blocking face increases would only compromise the system’s performance and reliability in the long term. Tight municipal regulation of fares was one reason the nation’s urban streetcar systems fell into disrepair in the 1930s and 40s, making them prone to purchase and closure by automobile companies. At the very least, WMATA should be able to adjust fares to keep pace with inflation (something the December decision allows). To create these graphs, I analyzed the current and new fares for my home station, the Shaw-Howard University station on the Green Line. This set includes some trips that clock out at the new maximum fare — $4.50. The fares operate at a flat rate until the trip reaches about 3 miles in length, and then progressively increases until it reaches about 15 miles, where it remains at a maximum fare. The reduced (off-peak) fares are divided into three tiers, and will remain unchanged under the new plan. 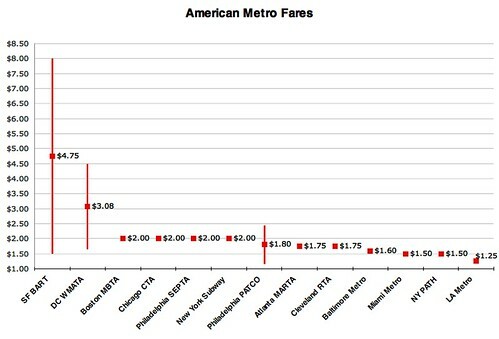 While this graph makes it look as if urban riders are getting a subsidy and suburban riders must bear a high burden, a quick look at the fares per mile shows a quite different pattern. Since most reliable estimates of the cost of operating an automobile range from $.50 per mile to $1.50 per mile, we can see most suburban commuters continue to enjoy costs substantially lower than driving if we exclude the more complex issue of speed. All this goes to make former WMATA Board Member T. Dana Kauffman’s claim the fare structure is a “raw deal” for suburban commuters all the more absurd. Lastly, riders are familiar with the system’s estimated trip times, presented alongside the fares in stations and online. These times take into account train frequency and the number of transfers required. While I’m not sure exactly how they are created (and assume they mean peak times), I’ve found them to be roughly accurate. Using this data I have graphed the average trip speeds from the Shaw station. What do you think of the fare system and the increases? I don’t have much to add except that I’m really impressed with your graphs. I wish you had incorporated the increase in parking fees into these charts, but I’m not really sure how you’d have done that. Nice work. Is trip length track miles or “as the crow flies”? I assume it’s the former… Also, I think the third chart could benefit from color coding by number of transfers required. The distances are track length, you can check roughly with Google Maps. The color coding is a good idea – although it’s not clear exactly how they calculate the time estimates. Yes, I should have noted the parking increase, but it will not impact all commuters, as many take buses or are dropped off at stations. The $.50 to $1.50/mile for driving figures are ludicrous – that assumes depreciation is a function of miles, which it really isn’t (much). Why is it ludicrous? This measure is a composite usually including not only the cost of the vehicle but also insurance, maintenance, oil and gas, and other expenses. AAA calculates the per mile cost of an automobile is $.50 to $.80 per mile. Many think the AAA values are actually under estimates. This calculator from California’s Santa Cruz County begins with $.86 per mile in direct costs for the driver, and then after adding societal costs like pollution and road maintenance brings the total to $1.19. If you disagree, please cite some evidence. This is a fully loaded cost that takes into account full depreciation, insurance, and all maintenance. The actual variable cost of operating a vehicle is $0.12 per mile ** plus gas. At $3.00/gallon and 25 MPG, gas comes to another $0.12 for a total of about $0.24/mile. Of course your mileage and vehicle costs may vary. Remember, most people in the suburbs still need a car to get to the Metro, to get to the grocery store, to transport kids to soccer games, and live a life outside of commuting. So for my last two commute locations, the 17.03 to 17.31 mile trips calculate out at $0.23 to $0.24 per Metro mile � even extended by about 2 miles each way because of road miles being longer, mean I have reached a tipping point where the cost to drive and the cost to take Metro are about equal. Given an opportunity to have personal space, and the travel time being shorter on good days and most mornings … why take Metro? The extra $2.00 daily that Metro is taking out of my pocket for peak-fares and parking has created a tipping point that makes no economic sense. Regardless, our disagreement will be determined starting Sunday, when we will see if there is a statistical dip in system ridership as suburban commuters opt to drive. For some people, the fare increase will be a “tipping point.” These are people who have free parking at work. If you have to pay for parking, metro is always cheaper no matter what. People may think that the cost per mile you quote isn’t realistic, so maybe they should think in terms of cost per hour the car sits doing nothing. At least you only pay for metro when you actually use it. And even if you consider taxes, you pay far less in taxes for metro than for roads, most of which you’ll never drive on. The IRS allows a driving cost of 50.5 cents per mile for tax purposes (which drives reimbursement rates at most companies). That’s probably the best number to use for your analysis. The problem with the AAA analysis is that depreciation is based on a new car (which has very high depreciation rate) but most people who are cost conscious drive old cars. Some additional data, partly thanks to my friend Matt. 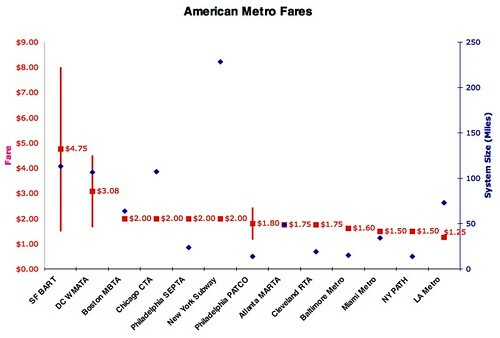 The chart shows the fares for all the American heavy rail systems, and those with variable fares are shown as bars with just the midpoint marked. I’m trying to do a direct comparison with BART, but finding the trip lengths is providing difficult. Rob, your analysis was quite interesting and informative! I plan to do a high-level study for MARTA (my primary customer). I’m interested in your opinion. What would be your take on MARTA converting their fare structure to distance-based? Do you think that their current all-smartcard system is a great foundation for converting to a distance-based system?